When structuring an effective Performance Management process at any organization, including some type of incentive to help drive performance is a key step. Particularly in recent years, large financial incentives are not always feasible, nor are they always found to be the most impactful driver for incentivizing employees. Nonetheless, a consistently strong majority of organizations both across the region and nationally, tie pay to performance either directly or indirectly. For a closer look at how organizations in Northeast Ohio are implementing these financially based incentives, we turn to the 2013 ERC Pay Adjustment & Incentive Practices Survey. Annual bonus plans remain the most common type of incentive pay, with individual incentives and profit-sharing filling the second spot, depending upon the employee group being compensated. Other less common incentives reported include, longevity service awards, retirement-based profit sharing, and executive performance bonus plans for select executive level positions. Payouts are typically distributed to employees on an annual basis, with around half of participating organizations on this schedule. Some organizations make these payments on a quarterly or even monthly basis, but these are few and far between in comparison. On average, the variable compensation cost as a percentage of revenue (i.e. variable compensation divided by total revenue) was found to be about 9%. In comparison, total compensation cost as a percentage of revenue (e.g. compensation cost divided by total revenue) was about 25%. 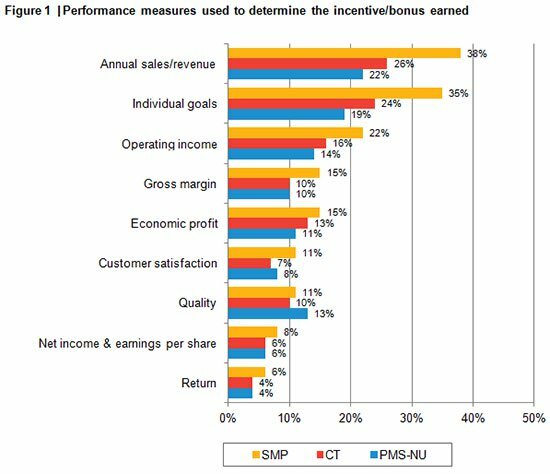 Clearly, paying out any of the incentives listed above comes at a cost to the organization, but with the help of a properly designed performance management process, the results achieved by your employees will more than off-set the dollar amounts allocated to incentive pay.